The Central Park Hotel is a 4 star hotel located in bustling downtown Nairobi, along Sheikh Karume Road between Ronald Ngala Street and Luthuli Avenue. At first glance you will notice that the Hotel is aptly named - The Grand Central Park Hotel. It's imposing architecture lets you know that you're walking into a hotel that prides itself on great cleanliness and superior customer care. Once inside you will be impressed by how the Central Park Hotel is elegantly furnished and beautifully decorated. The hotel is superbly designed with 85 spacious rooms that have electronic sensor doors fitted, local and cable TV, high speed wireless internet access, telephone, fully stocked mini-fridges and 24 hour room service. Our guests are also treated to one of the finest Health Club facilities in Nairobi with a well equipped Gymn, Sauna and Steam Bath as well as a Beauty and Massage Parlour. 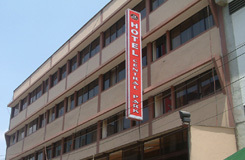 In addition to these facilities, Central Park Hotel also has modern conferences facilities for seminars and workshops. The Hotel's restaurants serve both local and international cuisine prepared by our chefs. Our fully stocked bar with various cocktales and drinks is also available on the hotel's first floor where sports fans can enjoy great sporting action from giants screens within the bar and restaurants. Central Park Hotel's location and proximity to anything you may need in Nairobi means convenience is something other Hotels only wish for... This indeed is, an oasis in the hub of this fast paced city where you can enjoy perfect health of body and tranquility of mind. Airport transfer from Nairobi Jomo Kenyatta International airport or Wilson airport to Central Park Hotel or trasfer from Central Park Hotel to Nairobi Jomo Kenyatta International airport or Wilson airport.